Citation Information: J Clin Invest. 2006;116(1):59-69. https://doi.org/10.1172/JCI25074. The majority of acute clinical manifestations of atherosclerosis are due to the physical rupture of advanced atherosclerotic plaques. It has been hypothesized that macrophages play a key role in inducing plaque rupture by secreting proteases that destroy the extracellular matrix that provides physical strength to the fibrous cap. Despite reports detailing the expression of multiple proteases by macrophages in rupture-prone regions, there is no direct proof that macrophage-mediated matrix degradation can induce plaque rupture. We aimed to test this hypothesis by retrovirally overexpressing the candidate enzyme MMP-9 in macrophages of advanced atherosclerotic lesions of apoE–/– mice. Despite a greater than 10-fold increase in the expression of MMP-9 by macrophages, there was only a minor increase in the incidence of plaque fissuring. Subsequent analysis revealed that macrophages secrete MMP-9 predominantly as a proform, and this form is unable to degrade the matrix component elastin. Expression of an autoactivating form of MMP-9 in macrophages in vitro greatly enhances elastin degradation and induces significant plaque disruption when overexpressed by macrophages in advanced atherosclerotic lesions of apoE–/– mice in vivo. These data show that enhanced macrophage proteolytic activity can induce acute plaque disruption and highlight MMP-9 as a potential therapeutic target for stabilizing rupture-prone plaques. Design and validation of experimental approach. (A) Schematic representation of the HSC transplantation experimental design. 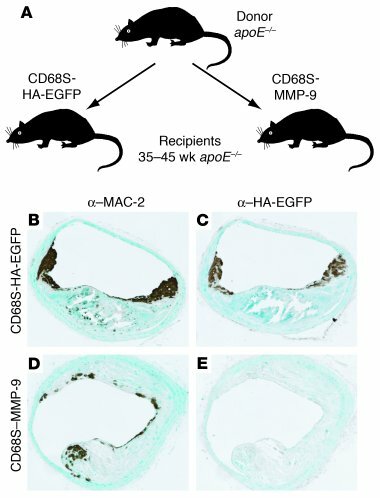 Bone marrow cells were harvested from 6- to 8-week-old apoE–/– donor mice and were transduced with macrophage-specific retroviral vectors encoding HA epitope–tagged EGFP (CD68S-HA-EGFP) or MMP-9 (CD68S–MMP-9) (29). After transduction, cells were injected intravenously into 35- to 45-week-old recipient apoE–/– mice. Mice were sacrificed 12 weeks after transplant, and lesion characteristics in the brachiocephalic artery were analyzed. (B–E) Analysis of retroviral gene expression in preestablished atherosclerotic lesions. Immunohistochemistry of similar lesions from apoE–/– mice transplanted with HSCs transduced with CD68S-HA-EGFP (B and C) or CD68S–MMP-9 (D and E) retroviruses reveals comparable levels of macrophage staining with an antibody recognizing MAC-2 (B and D). Only a subset of macrophages in lesions from mice receiving CD68S-HA-EGFP–transduced HSCs show reactivity with an antibody against the HA epitope (C and E). Original magnification, ×10 (B–E).